“When people say ‘it takes a village,’” Dr. Guy H. Palmer said, “they mean the power of many is greater than the power of one.” Meeting the goal of eliminating rabies as a cause of animal and human suffering by 2030 will indeed take a village. According to estimates by the World Health Organization, rabies takes the lives of nearly 60,000 people every year, including approximately 1,500 in Tanzania. Almost half of those are children under the age of 16. Palmer, the Jack and Janet Creighton Endowed Chair in Global Health, Regents professor in the Washington State University College of Veterinary Medicine and founding director of the Paul G. Allen School for Global Animal Health, also serves as senior director of global health at WSU. 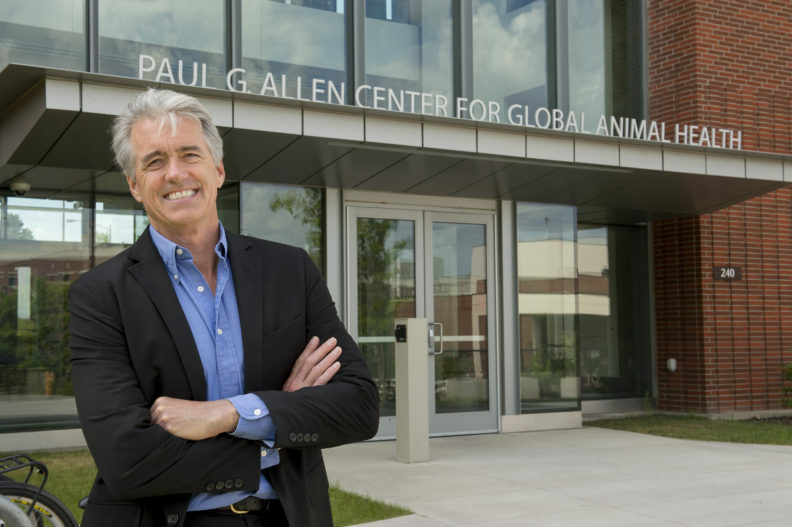 Ten years ago, WSU established the Paul G. Allen School for Global Animal Health within the College of Veterinary Medicine. The School’s founding director, Dr. Guy H. Palmer, now serves as senior director of global health at WSU. Palmer is a faculty member of the Nelson Mandela African Institution of Science and Technology in Arusha Tanzania and has been directly involved in research to create a sustainable rabies vaccination program in Tanzania. In developed countries, like the US, rabies is rare because of the high rates of dog vaccinations, accurate diagnostic tests, and clear guidelines on post-exposure treatment for bite victims. But canine rabies remains a threat to half the world, including Tanzania. The bite from a rabid dog often is deadly to humans living in Africa and Asia where access to health care is poor and post-exposure vaccinations are expensive. As a matter of fact, 99 percent of human deaths from rabies occur in Africa and south Asia. In an effort to improve global health, veterinary clinics throughout Washington state and nationwide have joined with WSU to educate their clientele on the global burden of rabies and how they can help by donating a monetary portion of each rabies vaccination to provide village-wide dog vaccinations in Africa. Through the generous support of Seattle-based Lien Animal Clinic, including donations by individual clients, an additional 1,000 dogs were vaccinated in March 2016. Vaccinating 70 percent of the dog population will protect humans and wildlife, including lions, from the disease. “In many parts of sub-Saharan Africa and Asia, where the death rates are highest,” Palmer said, “there is no reliable system to get vaccinations to where they are needed most.” So, with his implementation of help from the “village,” Palmer continues to make enormous strides in the effort to create a healthier world. Palmer directs the Robert R. Fast Laboratory at WSU and leads disease control programs in Latin America as well as East Africa. He heads the National Institutes of Health (NIH) Training Program in Infectious Disease and Microbial Immunology and holds an NIH MERIT award for research on pathogen emergence. Through Palmer’s work in the National Academies and the Consortium for Universities in Global Health, he’s become increasingly aware of the need to bring the full expertise of the University to bear on approaches in improving global health. To help direct WSU’s increasing interests in human and animal health across disciplines, regionally and globally, Palmer provides key strategies and vision. “Collaborative work,” he said, “and helping people across the globe, supports the original vision for the Allen School.” That vision speaks of advancing science, people, and policy to discover new approaches for disease intervention and the delivery of preventive health care for animals and humans. Improving public health and human opportunity has always been at the core of the Allen School mission, which is largely focused on the animal-human interface and working across traditional disciplinary barriers. Allen School faculty are leaders who have multidisciplinary expertise—in anthropology, economics, engineering, molecular epidemiology, and sociology—and they all work together to achieve the specific goals of improving global health. Palmer earned his bachelor’s in biology and doctorate in veterinary medicine at Kansas State University. With support from the NIH, he completed a residency in pathology and a doctoral degree in infectious diseases at WSU. Following his postdoctoral training, he served as a faculty member in the Department of Comparative and Experimental Pathology at the University of Florida before he returned to WSU in 1988. Palmer advocates the collaboration of expertise known as “one health:” this recognizes that the health of humans, animals, and the environment are interconnected. As a member of the Executive Roundtable of the Washington Global Health Alliance, the Advisory Board for the U.S. Global Leadership Coalition, and Advisory Board for Global Health at University of Washington, Palmer focuses on interdisciplinary approaches to improving public health and human opportunity. He serves on the Board on Global Health at the National Academies and chairs NIH Advisory Groups for COBRE and INBRE Programs, and the Biosecurity Research Institute. Several years ago, the Allen School received a gift from Jack and Janet Creighton—a gift that spurred the establishment of the Creighton Chair of Global Animal Health. The generous gift reflects shared goals and trust in WSU’s abilities to fulfill those goals. As the Jack and Janet Creighton Endowed Chair, Palmer has the responsibility to gain seed funding for high-risk/high-return exploratory projects, creative enhancements to graduate education, and fostering faculty and scholarly exchanges worldwide. The Jack and Janet Creighton endowment enables WSU to leverage opportunities regarding other funds to more rapidly bring about efforts in advancing animal health worldwide, thereby improving the health, wellbeing, and economic security of people, specifically those many millions who inhabit the poorest parts of the world. These people depend on healthy livestock for tilling, harvesting, transportation, food and fiber, and, perhaps most significantly, their livelihood. WSU deeply appreciates the Creighton’s commitment and enthusiasm for the mission of the School for Global Animal Health. Jack Creighton is a former president and CEO of Weyerhaeuser Co. He and Janet are among WSU’s most generous private donors, providing major financial support for scholarships, research and facilities. They each have given generously of their wisdom, time and energy as members of the WSU Foundation Board of Trustees and several deans’ cabinets and advisory boards.